Valves are the down and dirty hard working part of an irrigation system. The valves used in your irrigation system need to be able to handle the toughest jobs, under the worst conditions. Irrigation valves are manufactured from durable impact resistant polymers. They are designed for low flows and high, even working in effluent water — there’s a valve for every need. Control valves are used to ensure good pressure and flow. Pressure regulation is important for optimum sprinkler performance of your irrigation system. The valves use low voltage electric solenoids for easy on/off function from the controller. These valves control a zone or area of sprinklers. Using valves, you can build a system that controls all areas around your home. In designing an irrigation system, we always separate fixed sprays zones from rotor zones and lawn areas from landscape areas. 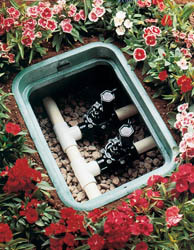 This ensures the correct amount of watering to the given area without over-watering and wasting your money.